Photos of Argan nut plantations in Morocco with goats climbing the trees to eat the nuts and pictures of Argan oil production in the Cooperative Marjana, Ounara, Essouira, Morocco. The Argan tree (Argania spinosa L.) is native to Morocco and is well adapted to the harsh conditions of South West Morocco. The Argan tree is though under threat and has been protected by UNESCO World Heritage making Argan oil one of the rarest oils in the world. Since ancient times the Berbers of Morocco have fed their goats on the yellow green flesh of the Argan fruit. The pits or seeds that were then processed to extract the Argan oil. The process is very labour intensive and require the Argan pits to be shattered by crushing them on a stone pestle after which the nuts are ground in a stone hand mill. The resulting slurry is then mixed with water which causes it to coagulate. The heavy paste that is produced is then pressed by hand to squeeze out the Argan oil. The pressed cake is then fed to the animals. The oil is rich in fatty acids and is used as a cooking oil but it is also highly prized as an additive to cosmetics as it has good skin healing properties and is good from the hair. The oil is also has also medicinal uses against rheumatism and the healing of burns. Even though there is some commercial oil press production today, the best Argan oil is still produced by hand. This has led to the formation of cooperatives where women meet to produce the oil that is marketed by the Coop. In South West Morocco the Argan tree is at the heart of an ancient agricultural system and the Argan tree provides food for the animals, vegetable and cometic oil but crucially it protects the land from desertification. The Argan tree has deep roots that holds the fragile sandy soil together and its canopy provides shade in this parched part of Morocco. This unique cultural system led UNESCO to add it to its protection list. 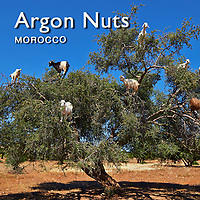 Our Argan photo collection also shows the climbing goats that you can find in the Argan trees foraging for their favourite food, the Argan nut.